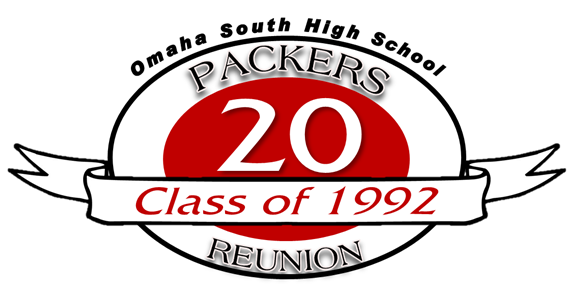 The Class of 1992's next major reunion - 30 years - will be in 2022. Friday Night: Enjoy catching up with old friends while eating dinner then off to the game to cheer on the Packers. Come join us for awesome food at G.I. Forum at 6pm and then off to a South High home game. Food/drinks on your own; discount tickets will be available for purchase at the game. Saturday Day: Tour of South High School from 10am to 12pm. Saturday Night: Starsky's Bar and Grill (7812 F Street, Omaha, NE) starting at 7pm. Come dressed in your favorite 90's attire and rock out to the music from our high school days! Pizza will be served for dinner and there will be karaoke and a DJ playing our favorite music. Cost - $15 per person. Sunday Day: This day will be dedicated to all of the families. We will be having a fun day at Columbus Community Center (located at 1515 S 24th Street, Omaha, NE 68108). There is a game room that has billiards, ping pong and foosball, a gym and a small meeting room where we can place snacks. Come join in on the fun and introduce your family to everyone. The cost for this event is $10 per family. Time will be from 12 pm to 4 pm. T-shirts are available for $7.50 and must be pre-ordered by August 31st. T-shirts are available in sizes Adult Small to Adult 4X. We will also have DVDs of what everyone was doing during the reunion. The cost will be $10. Show your DVD off to everyone and let them know what a wonderful time you had. Please purchase DVDs by September 30 and will be mailed to you after the reunion.